Irvine, CA – R.D. Olson Construction has finished construction on Tustin Pacific Center, a 196,000-square-foot mixed use hotel and retail project in Tustin, CA, featuring the latest designs by Marriott International for its Residence Inn and Fairfield Inn & Suites hotels. The 145-room Tustin Fairfield Inn & Suites represents the newest Generation 4 design by Marriott and is the first of its kind in Southern California, featuring an energetic, contemporary décor and inventive use of space throughout. 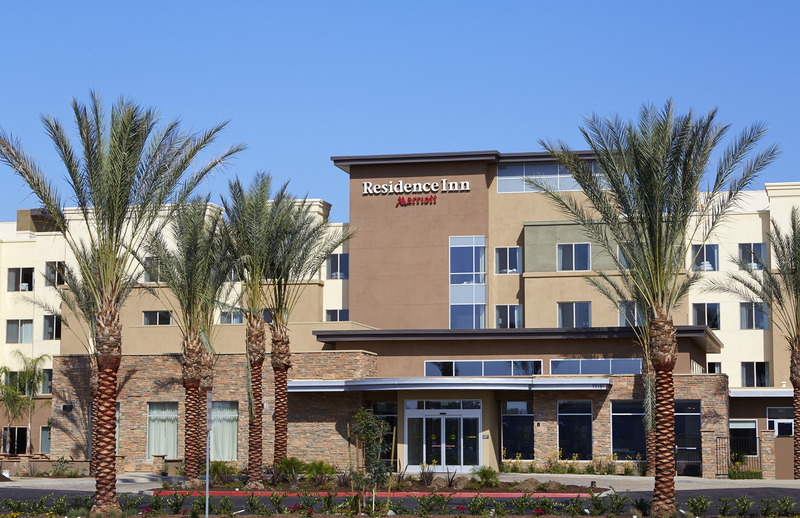 The Tustin Residence Inn, a 149-suite hotel, represents Marriott’s latest design for its market leading extended-stay brand. Both hotels were completed 30 days ahead of schedule, a notable achievement given the hotel’s new designs. R.D. Olson’s longstanding relationship with Marriott was a key factor in the contractor’s ability to deliver the project early. Indeed, the designs were so new that construction began prior to a complete definition of scope, yet the project teams worked together to fine tune the project as construction progressed. Upon final life/safety inspection, the hotels became the first two properties to be approved by Marriott for the same owner on the same day with zero deficiencies, a significant accomplishment. “Our expertise in hotel construction over the past 30+ years allows us to deliver projects with maximum efficiency through every phase of construction,” said Bob Olson, CEO and founder of R.D. Olson Construction. “The entire project team worked together seamlessly to deliver on Marriott’s contemporary new styling for these hotels,” added Olson. The Irvine, CA-based general contractor has built hotels for Marriott, Hilton, Hyatt, Ritz Carlton, Kimpton Hotel & Restaurant Group, Starwood Lodging, InterContinental Hotels Group and Wyndham Hotels & Resorts, among others. Marriott praised R.D. Olson’s ability to construct the projects ahead of schedule. “We value our longstanding relationship with R.D. Olson and their consistent performance in constructing high quality hotels in high performing markets,” said Eric Jacobs, chief development officer of Marriott’s Select Service and Extended Stay division. “The ability to complete these properties ahead of schedule allowed Marriott’s management team a sizable head start in organizing the opening of the two hotels,” added Olson. Both hotels have numerous guest amenities, including outdoor areas with pools, spas, fire pits and a sports court, exercise rooms, convenience markets, breakfast areas, business centers and meeting space for groups of up to 200 people. 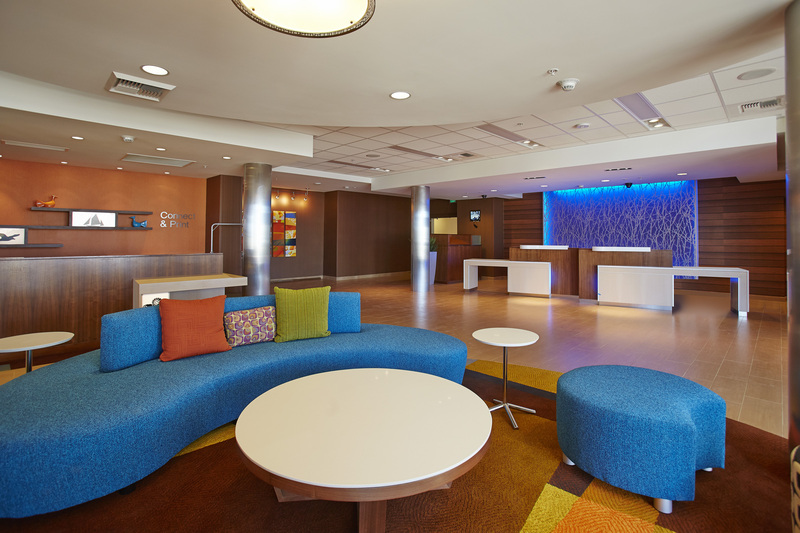 “The new design features the utmost in innovative guest offerings and convenience,” said Olson. The art in the hotel’s public spaces celebrates Tustin’s history, while guestrooms are adorned with lifestyle images of Orange County’s beach communities. Tustin Pacific Center was designed by Gene Fong Associates, with interior architecture by Johnson Braund Design Group, Inc.
Tustin Pacific Center also includes a 16,180-square-foot retail center that has been leased to Starbucks, Flame Broiler, Subway and FedEx Office. Perkowitz + Ruth Architects designed the retail component of the project. The new project has a prominent location on the 55 Freeway at Edinger Avenue in Tustin, and represents another first in the local lodging market: these are the first new hotels built in Tustin in more than 15 years. “Tustin Pacific Center will serve the business travel needs throughout the surrounding area, including John Wayne Airport, the Irvine Business Complex and the Santa Ana Civic Center,” added Olson. The project is also a 10-minute drive to Disneyland and Angel Stadium of Anaheim, and is convenient to the beach cities in Orange County. R.D. Olson Construction has completed several new hotels in the last 18 months, including the Residence Inn by Marriott in San Juan Capistrano, CA, and Courtyard by Marriott hotels in Oceanside and Santa Barbara, CA, Maui, HI, and a pending completion in San Jose, CA. Earlier this year the firm completed the nation’s first Legoland Hotel at Legoland California Resort in Carlsbad, CA, and the company is currently under construction on an 8-story, 210-room Courtyard by Marriott in the heart of the Irvine Spectrum Center that is scheduled to open in the summer of 2014. The general contractor is also active in the construction of office buildings, retail centers, apartments, restaurants, health clubs and country clubs. R.D. Olson Construction completed several restaurants during the past year in the newly renovated Los Angeles International Airport and at John Wayne Airport in Orange County, CA. R.D. Olson Construction has also recently completed the 36,000-square-foot headquarters facility for Open X in Pasadena, CA, and an Equinox health club facility in Encino, CA.